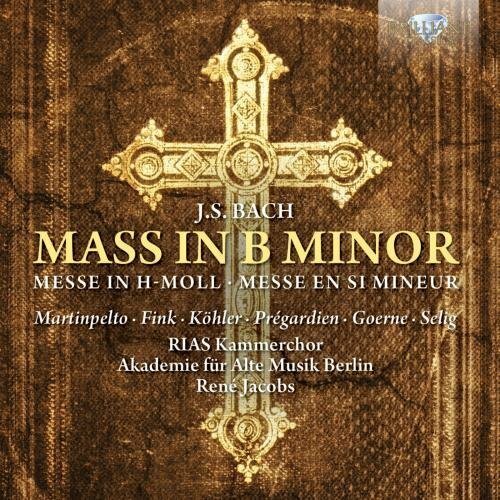 Johann Sebastian Bachs Mass in B minor is regarded by many as one of the supreme achievements of Western classical music. Even before its first complete performance, the Swiss music historian and publisher Hans Georg Nägeli described it as the greatest musical masterpiece of all times and nations. Many scholars believe that, along with the Art of Fugue and the Musical Offering, the work presents a summation of Bachs musicianship as well as the most glorious presentation of the composers deeply held religious beliefs. Much of the Mass gave new form to vocal music that Bach had composed throughout his career, some of which was not from sacred sources (a point of contention for Leipzig churchgoers). The Kyrie and Gloria (known as the Missa) had been written as an application for the post of court composer at Dresden. The remaining movements, the Sanctus, Benedictus and Agnus Dei, turn the Missa into a Missa tota: the full setting of the Ordinary of the Mass. The enormous length of the final product (around two hours in duration) was clearly beyond the requirements of the divine service in Leipzig and indeed any liturgical purpose; a matter which remains the subject of scholarly debate. Indeed, it is probably due to its scale that the complete work wasnt performed in Bachs lifetime. The music itself is full of a variety of styles. In the Kyrie, Bach explores three different forms of musical expression in an impassioned entreaty for Gods mercy. He brings in trumpets and drums to sing the praises of the Lord in the Gloria, Credo and Sanctus, and, as so often before, saves one of his most exquisite and poignant musical phrases to express the idea of peace in the et in terra pax. The dramatic contrast forged between the Crucifixus and Et resurrexit movements of the Credo serve as a dramatic representation of the Christian statement of belief, and the lamenting Agnus Dei aria gives way to a exultant chorus of Dona nobis pacem (Grant us thy peace), bringing the vast score to its conclusion. René Jacobs directs the Akademie für Alte Musik Berlin in this reading, which was described as Spacious and intimate a compelling performance by the BBC Music Magazine following its first release.